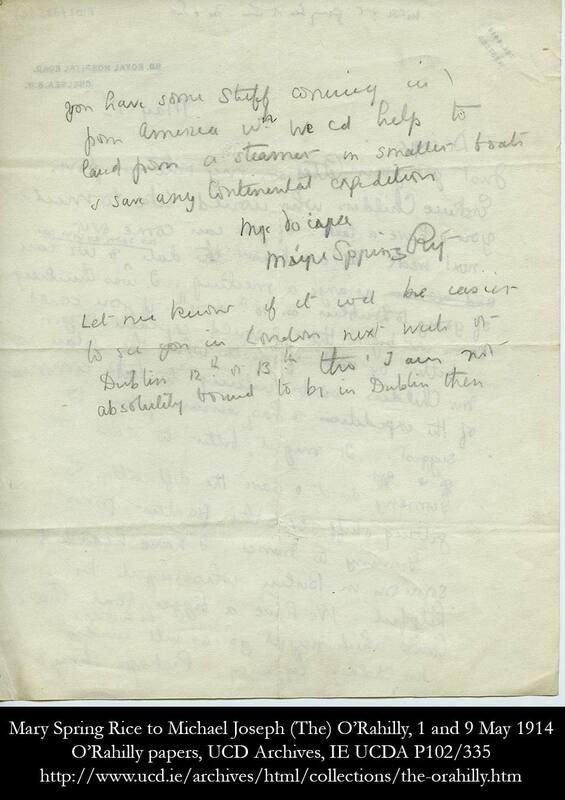 Mary Spring Rice to Michael Joseph (The) O’Rahilly, 1 and 9 May 1914 O’Rahilly papers, UCD Archives, IE UCDA P102/335. Part 5 of our Centenary Special. 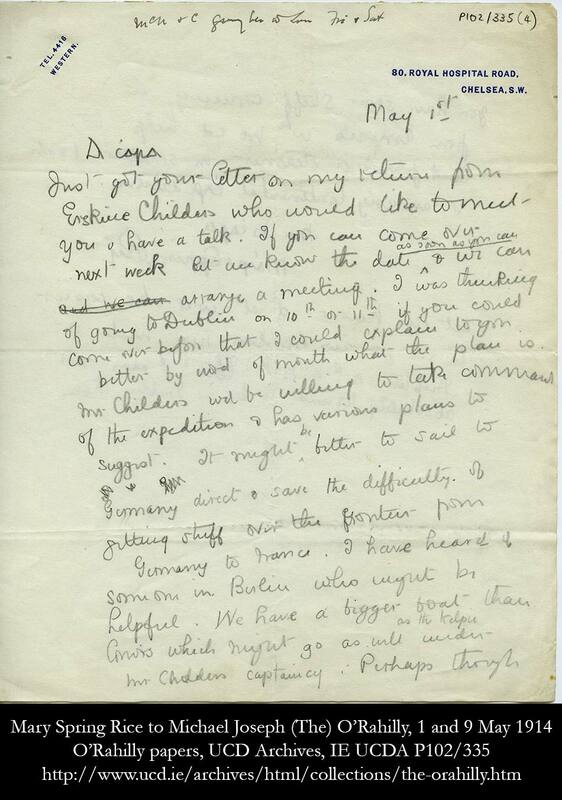 Original letter, transcript and analysis by Dr Conor Mulvagh can be viewed below and here (in PDF). 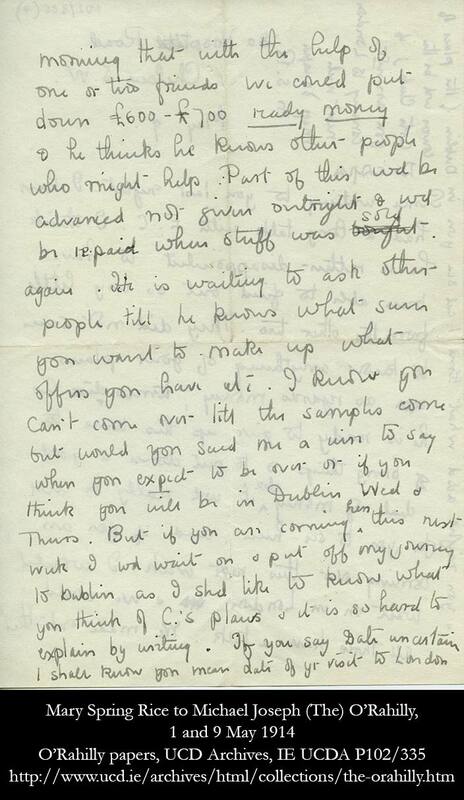 All images from The O’Rahilly papers, courtesy of UCD Archives. 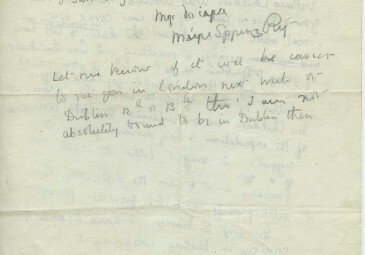 May’s ‘From the Archives’ documents are a pair of letters written by Mary Spring Rice to The O’Rahilly on 1 and 9 May 1914. They detail the early planning phases of what would ultimately become the Howth gun-running: the importation of a consignment of 1,500 rifles and 45,000 rounds of ammunition that had been purchased at Hamburg by Darrell Figgis and Erskine Childers. The latter captained the yacht which brought the majority of these weapons ashore on 26 July at Howth. The remaining 600 rifles came ashore at Kilcoole, Co. Wicklow on 1 August, the day Germany declared war on Russia. In the background of the Howth and Kilcoole landings was the Larne gun-running. On the night of 24-25 April, Ulster unionists had successfully landed approximately 25,000 rifles and 3 million rounds of ammunition at Larne, Bangor, and Donaghadee on the north Antrim coast. 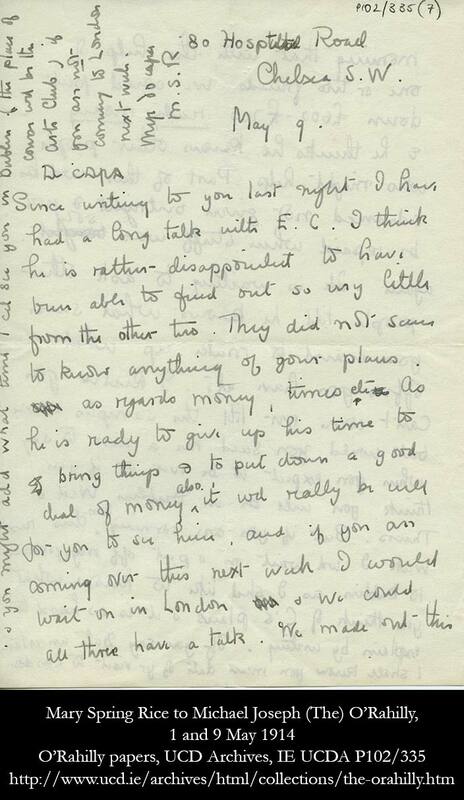 April’s UVF gun-running, coupled with the loss of confidence in the British military in Ireland after the Curragh crisis of 20-23 March (see March’s From the Archives), created a wave of panic in nationalist Ireland. Historian Aodogán O’Rahilly estimates that the nationalist Irish Volunteers were signing up 1,000 new recruits per week in this period. 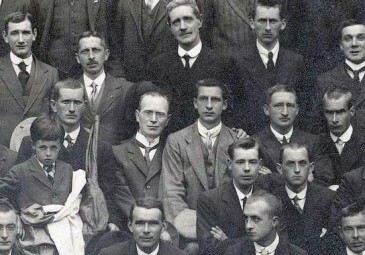 By the end of summer 1914, the Irish Volunteers dwarfed their Ulster counterparts in terms of manpower – although not armaments – with 180,000 volunteers in the ranks, not even factoring in the members of the women’s auxiliary, Cumann na mBan. The twin Larne and Curragh crises did not just produce recruits for the Irish Volunteers. They also spurred the organisation’s leadership to arm. The importations in Ulster had been a meticulously planned and lavishly financed operation and organisers in Dublin simply could not echo it on anything like a similar scale. One of the key differentiating factors between the Larne and Howth gun-runnings is that the former was conducted under the cloak of darkness whereas the latter was done in broad daylight. From the perspective of the Irish Volunteers, the unionists’ night importation had established the right for paramilitary organisations to import arms and to parade openly with them, as was happening in Belfast without police interference. 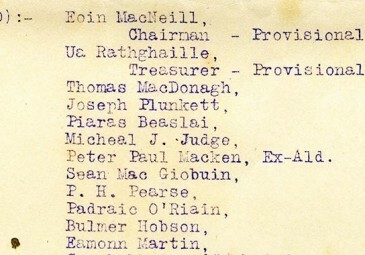 There was a clear desire among the Irish Volunteer leadership to challenge the authorities on this point and to highlight the dissonance between government policy towards the actions of Ulster and Irish Volunteer forces. 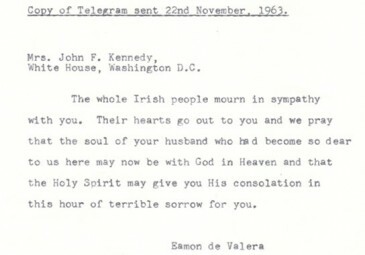 Ultimately, Dublin Castle did not agree. As the Volunteers made their march from Howth to Dublin city centre, a fracas broke out with freshly armed volunteers on one side and military and police on the other at the southern tip of Clontarf. If provocation was what the Irish Volunteer leadership wanted, they were given their standoff at Clontarf. Last month’s History Hub video on the legacy of the 1014 Battle of Clontarf goes in to greater detail on how medieval memory was put to political use on 26 July 1914. Following the standoff at Clontarf, one of the military units involved in the incident was taunted by crowds on the quays of the river Liffey as they returned to barracks. With tensions high, jeers were met with bullet and bayonet and four unarmed and unaffiliated civilians were killed in what became known as the Bachelors Walk massacre. 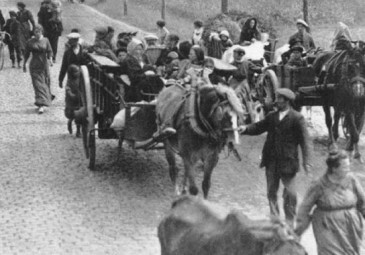 The bloodshed at Bachelors Walk, coupled with the arming of the Volunteers at Howth, makes 26 July 1914 one of the tensest turning points in Irish history. Just nine days before Britain declared war on Germany, Ireland stood on the knife-edge of civil war. This month’s document details the very inception of the process that led to that day. A small circle, centring on Roger Casement and Erskine Childers, took the lead in organising the purchase and importation of arms. Childers remains one of the most fascinating characters of this period. As a novelist, he thrilled the British public with The Riddle of the Sands in 1903 but he is nowadays better known for his exploits rather than his writings about life at the helm of a yacht. Mary Spring Rice, the author of these letters, played a major role and is credited with conceiving of the idea of using private yachts for the expedition. She offered the use of her own fishing boat, the Santa Cruz, but it was in poor condition and deemed unsuitable for the voyage. 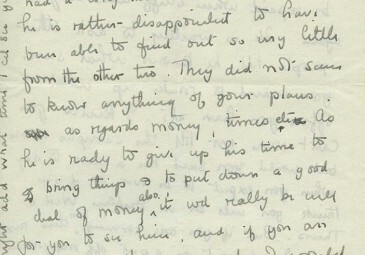 The organisers ultimately opted to use Childers’ yacht the Asgard and Conor O’Brien’s yacht the Kelpie which is referenced directly in these early letters. Spring Rice’s diary of the voyage, published in 1964, remains one of the most vivid accounts of the expedition. 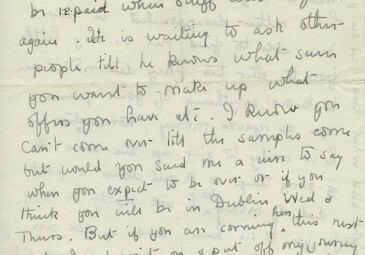 Letters such as those published here highlight the fact that the role of women in the Howth gun-running was anything but auxiliary. 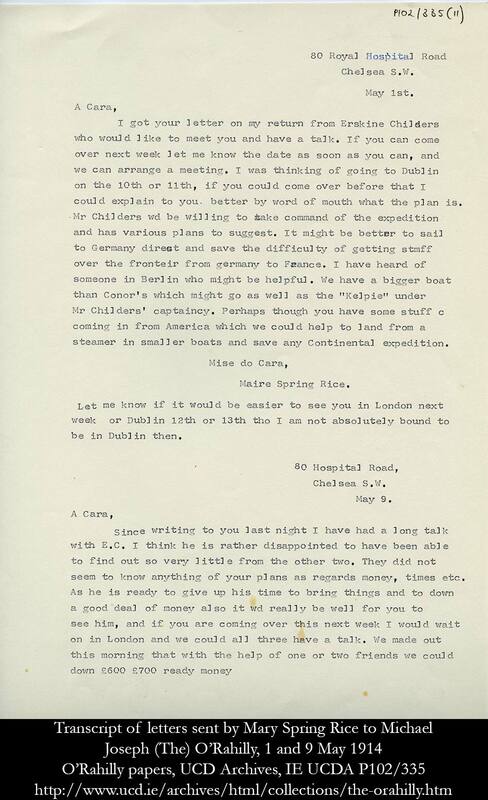 Not only was Spring-Rice pivotal to the planning of the expedition, here we see her acting as the pivotal liaison between a leading member of the Irish Volunteers’ provisional committee and the leader of the expedition upon which she is about to embark. Additionally, both Spring Rice and the Historian and Republican Alice Stopford Green, both women of substantial independent means, were at the centre of financing the operation. The £600-700 reference here would eventually rise to £1,500: £1 per rifle with all its accessories and ammunition. Today in the light of the freedom won, we salute all who, in any measure, helped to bring that freedom to us – in particular those who brought to this quay the white yacht, the ‘harbinger of Liberty’, as The O’Rahilly called it. 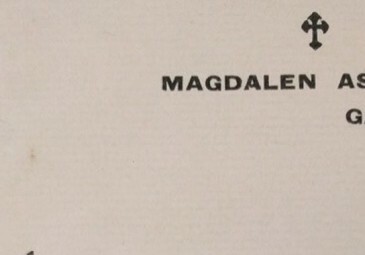 May it ever be for us a symbol of hope and confidence, and may the names of Erskine and Mrs Childers, Mary Spring Rice and their other companions of the Asgard never cease to be revered among us. It would appear that simplistic retellings of the past still hold sway among large bodies of the Irish public North and South. Last month’s commemorations of the Larne gun-running saw thousands march through the streets of Larne in period costume and with many carrying imitation firearms. Progressive Unionist Party leader Billy Hutchinson, dressed as Edward Carson, headed the procession and reiterated Carson’s exhortation to unionists to trust in their leadership. It is doubtful if anything was said about the role of German arms dealers in both the Larne and Howth affairs given that Northern Ireland is only two years away from commemorating the slaughter of the 36th (Ulster) Division when they faced German guns at the Somme. Conor Nelson’s excellent article in this month’s History Ireland underlines how the facts of the Howth gun-running remain complicated to this day. 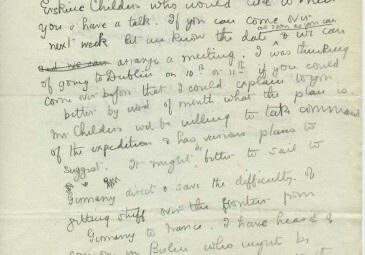 The presence of Erskine Childers’ friend, Gordon Shepard, then a serving officer in the Royal Flying Corps, and the ability of the Asgard to sail right past the Home Fleet unmolested are just some of the enduring questions that muddy the waters of the simplified Howth story. Despite the great lengths that the British government went to in banning the importation of arms to Ireland in late 1913, there were no legal repercussions for the Howth gun-runners and the Asgard sailed from Howth to Hollyhead without incident. Conor Nelson notes how the Mr and Mrs Childers were actually present in the House of Commons when Sir Edward Grey announced that Britain had declared war on Germany. 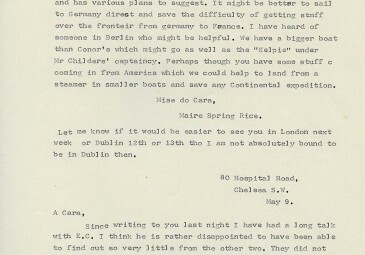 Although the allegiance of one’s relatives is no indicator of individual outlook, Mary Spring Rice played a dangerous game, her uncle Cecil was, at the time of the Howth landings, British Ambassador to Washington. Government inaction and the linkages between participants and the very highest echelons of the British (Liberal) establishment are just two reasons why the voyage of the Asgard is something to be investigated rather than celebrated as we approach its centenary. Certainly the proximity of Irish society to a bloody and sectarian civil conflict in July 1914 is something that should provoke pensive reflection across Ireland as certain groups rush to their flags and their banners. Like Larne, the story of the Asgard and the Kelpie remains utterly striking in Irish history. However, like the Boston tea party, we should not be afraid to tarnish the exterior as we search for better and more nuanced understanding of events that were both pivotal and incredible in the emergence of independent Ireland.